I just want to take a step back and revisited last week writing theme on unblock the block. Now if you were hanging round the Ad Astra Forums (http://forums.adastrafanfic.com/index.php?/topic/2342-week-ten-unblock-the-block/?p=43422) you will have seen I’m trying to unblock a story I start back in February 2014 for the Holiday Origin story challenge. The story features the stars of the Ariane NX-04 stories with a bit of a focus on Naurr and Douglas Gorrim. 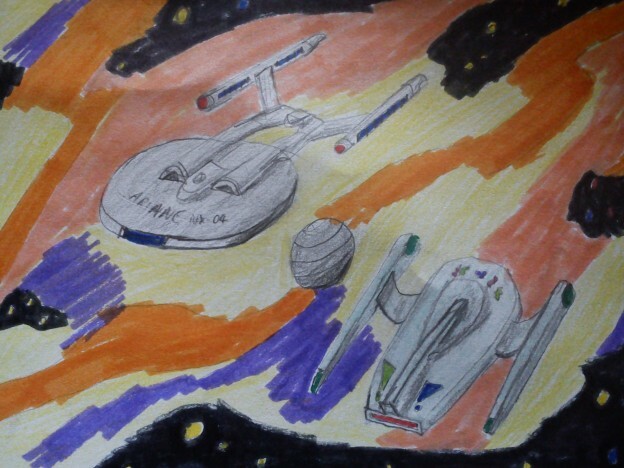 So far so good and I had a good organ idea which was inspired by reading David A. Goodman excellent Star Trek “Federation – The First 150 Years” and the piece about the Romulan War and in particular the Romulan devastating attack on Denobula 1st October 2158 so they could use they spaceport as a staging area before they attack on Sol a couple of weeks later. The thing that stood out to me was the Denobulan entered the Romulan War as Earth only ally yet there was no mention of humanitarian aid or mutal support from Earth. So as the other warp five ship were mention in the battle and none in defense it struck me that it would be a perfect opportunity to squeeze in the Ariane as it provide humanitarian aid and did the other functions that would have been need during an interstellar war with a unknown source. The problem is to me the story seemed to have just a background but no challenge and despite several point of view changes the story just didn’t seem to having any hook. So for Unblock the block I’ve tried to get the story going again with the help of the kind Ad Astra writers. It has improved and by bring in the temporary food shortage..
Captain Douglas Gorrim looked out of the window at Denobula, while taking another sip of his dark black coffee, which was as bitter as his mode. He looked once more upon the scares that the Romulans had inflicted upon an unsuspecting world. Behind him on the table lay several PADD with various department heads status reports on. As the world slowly rotated below him he could see the six massive creators that the Romulans had inflict, to stop the Denobulan from resisting the Romulans abuse of their space sport facilities. The Romulans were now long gone their expedition/invasion force to Sol had walked into Admiral Gardiner Ambush and been devastated. Douglas activated his ship log reporter and said into it. 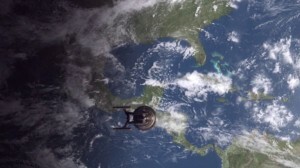 “Captain Log’s October 26th 2158 supplemental, The Ariane is now in orbit around Denobula and even from orbit the devastation of the Romulan recent callous attack is evident, the death count is many millions and with so many still missing I suspect it will only get higher over the coming days. The Ariane crew are providing direct aid to the shell-shocked Denobulans, So far I’m proud to say that Commander Ziyl Engineering team have manage to establish two temporary power plants to allow the local civil defense force function better and dig several latrines to assist with the crippled and struggling local sewer system. However at the moment they are working overtime on helping the Denobulans to repair their overworked mass protein re-sequencers back on line. I’m told that the first signs of famine are already starting to show in the major urban areas. Lieutenant Comsox science team are aiding the CMO Dr. Bernardine Keating-Fong team in identifying any wound buried under rubble but sadly more often than not they’re just pulling out more dead. I understand this morning the Beta shift team end up recovering bodies from a destroyed Children’s Hospital, I do not envy them having to do that, so in accordance with the good Doctor recommendation Beta Shift members have being put on reduced hours in order to keep them at peak efficiency, I almost wish we had a train councillor onboard to help them through the mental ordeal. While Chef Naurr has gone into over drive with his soup kitchen to try and feed as many people as he can in the third city where food has struggled to get through, till we arrived. Lieutenant Akua security teams are working with the MACO’s and the local police to try and keep order at the kitchen so we can feed as many of the locals as we can, as fairly as we can. While the crew still onboard Ariane have switched to emergency rations, so that there is more food available to help the starving Denobulans. While we await the arrival of the Enterprise and the Lexington with fresh supplies from other coalition members, I’ve tried to keep only a skeleton crew on Ariane so everybody who can be spared is planet side trying to provide extra aid. However Doctor Keating-Fong tells me that all of my department heads are already starting to show the strain of this aid mission, thus we’ve agree that she has a watching brief to send anybody back to the ship who can’t physically or emotionally cope with their assign task. I’ve spoken with the Denobulan ambassador to the Coalition; thankfully she see this as a sign of the Romulans pure evil and not something that can be placed on humanity for being at war with them over the Starbase one massacre. I get the impression that as soon as the Denobulans get a new leader elected to replace the one killed in the attack, we will finally have another coalition member join us in the war against the Romulans. The ship intercom whistle and his communication officer Ensign Savio Dubrovnik call interrupted Douglas. With an acknowledgement to Savio, Douglas pulled out his communicator and switches it to channel two. “Captain Gorrim here,” he said. He was greeted by static, so he made a couple of adjustments before he hear Naurr voice. “I’m on my way,” Naurr. With both shuttlepods already out on Denobula, and only being able to find one squad of MACO’s fit for duty on the Ariane, Douglas decided to risk it and use the Ship Transporter to beam down directly to the Soup Kitchen. As the light and transporter paralysis left him Douglas could see why Naurr had struggle for the right word. The Denobulans were gather in loud crowds around the soup kitchen, most were dirty or wore damage clothes. There seem to be holding up touches and farming instruments. He estimates that the Ariane and local law enforcement were heavily outnumbered. “I predict a riot!” replied another. Douglas turned round and give them both a hard stare, that he had recently learn from the MACO Major in charge of the MACO on the Ariane and the MACO with him got the hint and went silent and adopt a more active defense perimeter around him. They’re arrival had gone unnoticed by either side and Naurr and a Denobulan in a uniform rush up to greet him. “Captain!” Naurr shouted as he rushed up and hug him. The Denobulan in the uniform spoke and it only took a moment for Douglas translator to pick the required translation. “What’s the situation?” asked Gorrim. Phvolph wait for the translation before replying. “Evacuate your people or convince them the food will not run out,” answer Phvolph via the translator. “Which are both four hours away, I’m guessing it would take us an hour to use that up?” asked Douglas. “How do you hope to do that?” asked Naurr with a bewilder look on his face. Still need a lot more work, the purple I know but what do people think of the latest bit? Anyway Safe Treking till next time. This entry was posted in Twelve Trials of Triskelion and tagged TTOT 2014 on August 2, 2014 by falsebill.